Compared to Windows machines, Mac computers have a much more formidable reputation when it comes to reliability and data security. However despite its more stable operation, Mac operating systems too can crash and comprise the data encompassed in the disk drive. Also a hard drive running a Mac OS too can develop bad sectors or logical errors and compromise the stored data. 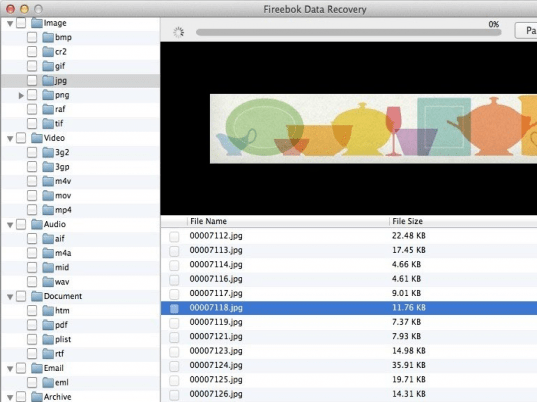 In order to recover the data from a Mac file system you can take the help of Fireebok Data Recovery 2.8.0 application. It comes equipped with a sophisticated algorithm to match the most challenging recovery scenarios. On launch the Fireebok Data Recovery 2.8.0 application sports a neat interface with three major options. To start with you can opt for the Deleted Recovery option which brings back any files that got accidentally deleted. Next in case you wish to recover missing data most likely caused due to a logical error, you should choose the Deep Recovery option. The tool allows you quickly view the missing data and preview them before choosing to complete the recovery process. It also marks out invalid files so that you do not waste your time recovering them. Further its third major option deals with locating a missing partition along with its content. The application offers you a set of advanced filters to narrow down your search and look for specific file types. At any point of time during the scan and recovery process, you can choose to stop the application and reconfigure your filters in case you find desired results are not showing up. It also can restore a missing file at its previous storage place. Overall the Fireebok Data Recovery 2.8.0 application shows a distinct edge in recovering more data consistently than many of its illustrious peers and hence earns a score of three rating stars.